Magical 1920's Venice Beach Ocean View House(on the cover of Country Living Magazine).Classic beach house. Are you in Venice or Cape Cod? Dark hardwood floors, white beamed ceilings. Open & comfortable flowing space, white slip covered down couches amidst vintage country antiques. Fireplaces in living and kitchen. Entertainer's paradise. Dining room table seats 8 plus. A cook's white marble, subway tiled kitchen:farm house sink,Viking range,island with second sink,Subzero frig. French doors open to Adirondack chairs on the porch stepping down to large brick back yard with fountain, fireplace & stainless gas BBQ. Master bedroom with king bed and master bath with clawfoot tub and separte shower. Guest bedroom with king bed. Additional bathroom with shower. Loft bedroom with two double beds. Daybed too. Sitting room with double sofa bed. Master Bedroom & Guest Bedroom have lush king beds, beautiful linens, down pillows & comforters. Master bath has large claw foot bath tub, white tiled shower and pedestal sink. 2nd bath has deco tiled shower. Library area between bedrooms may also be used as sleeping area with sofa bed. 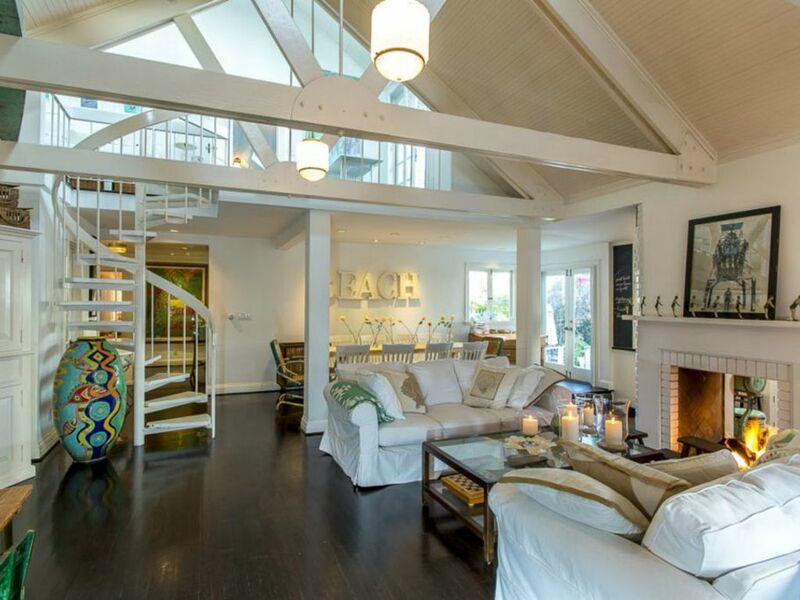 Spiral staircase in living room leads to an open ocean view loft and loft bedroom. Step out to the balcony deck with seating for sunset cocktails overlooking the beach. Classic sun room provides another relaxing space to view the surf. Outdoor hot water shower for rinsing off after the beach. /WiFi/ Cable TV with all premium channels. HD TV in living room and master bedroom- tv also in kitchen. Stereo speakers in house, outside decks and backyard. Washer Dryer in garage. Hot water beach shower in yard. Beach bikes, beach towels and chairs available. Expansive dining area in backyard. A warm, comfortable home that oozes charm - we loved every minute of it. Nous avons adoré notre séjour à la Beach house. On s'y sent réellement en vacances. La maison est non seulement très belle mais elle est particulièrement bien équipée. La cour intérieure est immense et très bien meublé, je regrette de ne pas y avoir passé plus de temps . Le salon, la cuisine, la salle à manger et la chambre des maîtres sont très agréable à vivre. La 2e salle de bain est petite, ça va pour les enfants mais pas pour un 2e couple. Il n'y a pas d'air climatisé, on réussi à faire des courants d'air mais vu la situation de la maison, c'est un peu bruyant le week-end (nous y étions du 26 juillet au 4 août, période chaude et très occupée). Suzanne est facilement rejoignable (elle a fait réparer le broyeur 2h après que nous lui aillons demandé). Nous pensions souper au resto à tous les soirs mais avons souper à la maison 3 soirs sur 9 et avons passé de bons moments sur le bord du feu. TAKE TIME TO SMELL THE ROSES!!! Yes, indeed....take time to smell the gorgeous, homegrown roses at The Beach House!! Our family had the pleasure of calling this house "our home" for the holidays...beautiful, cozy, delightful, warm & welcoming from the moment we walked in the door. We "ooohed & ahhhhhed" as we made our way through the main house & the guest house, finding lovely roses adorning dining tables, bedrooms, baths, not only embellishing the houses, but our lives as well. Such a nice homey & loving touch to share from the owner's garden, along with memories & history made through the years, as their family shares with guests in photos, memorabilia, treasures to discover & enjoy from room to room. The descriptions of this rental are accurate, & upon our stay, these descriptions came to life & were breathtaking beyond our belief. Our many thanks to Susan for sharing her amazing home with our family.....we filled it with our children, grandchildren, visiting friends & family, who adored the guest house, having their privacy yet our togetherness also. Susan made everything easy, convenient, ever so enjoyable, & she was always just a phone call away, even stopping by if we needed her. We were given a new gift of friendship!! A guest will not want for one thing in the elaborate kitchen, anyone's dream & especially for a huge Thanksgiving dinner & family/friends galore! We overflowed into the fully open concept of dining room, living room, kitchen, all opening out into a huge courtyard/patio area that connects the front house w/the guest house. Many days & nights were spent by all of us sitting out by the fire, telling stories, reminiscing & making more memories together. How we enjoyed the advantage of being able to walk just about anywhere, less than a block from the boardwalk, bike & jogging trails, downtown Venice w/numerous shops & restaurants. We grandparents even walked to the Santa Monica Pier & the Promenade & back, did workouts at the nearby Gold's Gym & trekked to coffee shops & Whole Foods, great adventures, & many others at our fingertips for hikes nearby & places to explore! Our thanks also to Susan's most helpful neighbor, "C" for always being willing to help out in anyway, to sweet "O" who would arrange to come & clean or tidy up anytime & brought lots of sunshine to our lives, & to "A" the gardner who keeps the grounds so beautiful. This truly was the perfect place, a special time, for our family to make lasting memories & we cannot wait to get back again!! We had a great time!!! Susan meet us at the house and explained all there was to know about the property. This home was one of the best vacation homes we have stayed in. Very clean and comfortable (cozy), and includes everything you would need (Great Kitchen, Bikes for everyone, outdoor grill, washer and dryer awesome relaxing fenced in back patio with bonfire pit. Location could not have been more perfect for us and our teenage daughter’s right in the middle of the Venice Pier and Sana Monica Pier walking distance to the beach and shopping. Overall this is a great "Beach House". We will definitely rent this location again! Thanks Susan for everything from Michigan! Truly the best way to experience LA. The house is beautiful and relaxing, just like in the photos. A fabulous kitchen, private courtyard and back patio, deck with ocean view, and comfy beds. Bikes for everyone to ride on the boardwalk which is steps away from the house. Lots of great food within walking distance. My favorite, Moon Juice, is just a few minutes walk down Rose Ave. This place is in such a great location if you want the energy and crowds on Venice boardwalk and also so private and calming in the fenced in courtyard. We have stayed here several times and like it more each time we come. Sue is a fabulous hostess and will take amazing care of you. Hoping to return to the Beach House soon! AT THE BEACH!!! 20 steps to the sand. See the waves breaking while sipping a glass of wine from the house. 1 block to Venice/Santa Monica Main Street shops, restaurants, yoga & pilates studios and gyms. Close to chic Abbot Kinney Blvd. with eclectic shopping and dining. Blocks from the Santa Monica Pier and the Third Street Promenade. Basketball and tennis courts blocks away. Main House: 3 bedrooms, 2 baths. 3500.00/week summer and holidays 4000. seasonal rates may apply Guest House Listing #332641: 3 levels/1 bedroom/1 bath. 2500.00/week 2800.summer and holidays **seasonal rates may apply MINIMUM RENTAL IS 1 WEEK. Additional days will be prorated. Main House and Guest House Listing #332641may be rented simultaneously.